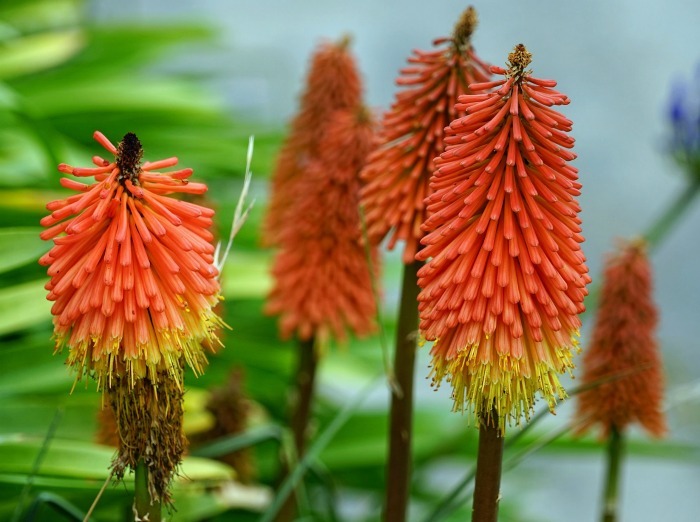 The red hot poker is a showy and dramatic plant. If you love growing perennials that give color all summer long, this is the plant for you. Other names for this showy plant are torch lily and poker plant. 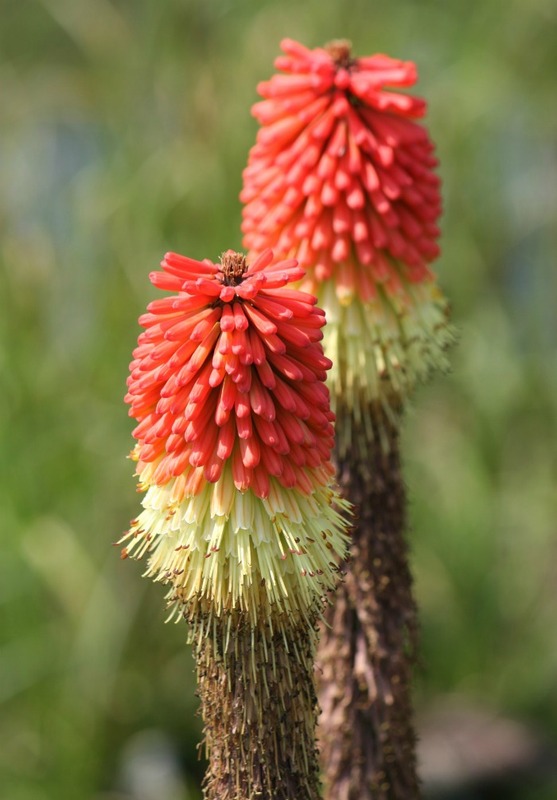 The botanical name for this plant is kniphofia uvaria and there are more than 70 known species of it. The red hot poker is a member of the liliaceae family which is home to common lilies. These drought and heat tolerant perennials do well in the heat of mid summer, long after some of the other plants in your garden have started to suffer from the heat. If you live in an arid area, it is the ideal plant for you. The plant is native to South Africa. Growing a Red Hot Poker plant is very easy. Red hot poker plants like sunlight. I originally had one planted in a semi sunny location and it was always reaching for the sunlight. Plant it in full sunlight and watch it really grow! This plant is a tough summer bloomer that does well in the hot days of summer. Although not particularly picky about soil, red hot poker does seem to do well in loose soil that drains well. It will benefit from the addition of organic matter, such as compost, before planting. 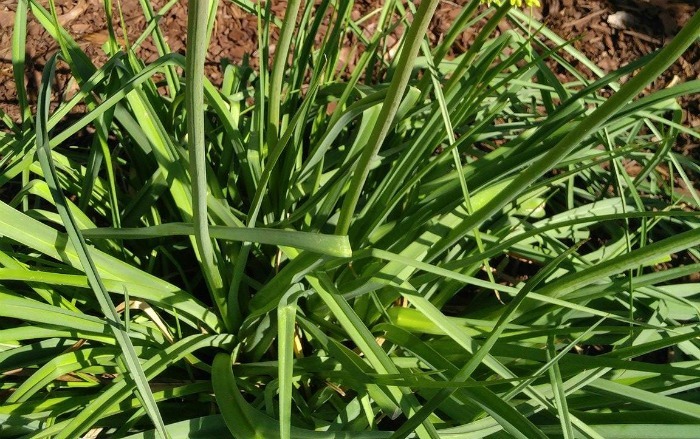 This perennial actually likes the soil to be a bit dry as long as it is not TOO hot. If it sits in wet soil, the crown of the plant can easily rot. They don’t need a lot of watering, but you should take care to keep an eye on the watering during the hottest days of the summer. This torch lily plant is in my hottest garden border and does not need much watering, but I set up a sprinker when the days get really hot. The flower spikes start to appear in the spring. They have a muted color and are smaller at first but soon become rich with color and shape. The flowers are quite long lasting. If you take care to deadhead the spent flower stalks, it will continue blooming all the way through to fall. This means that you can use the blooms for cut flowers indoors! 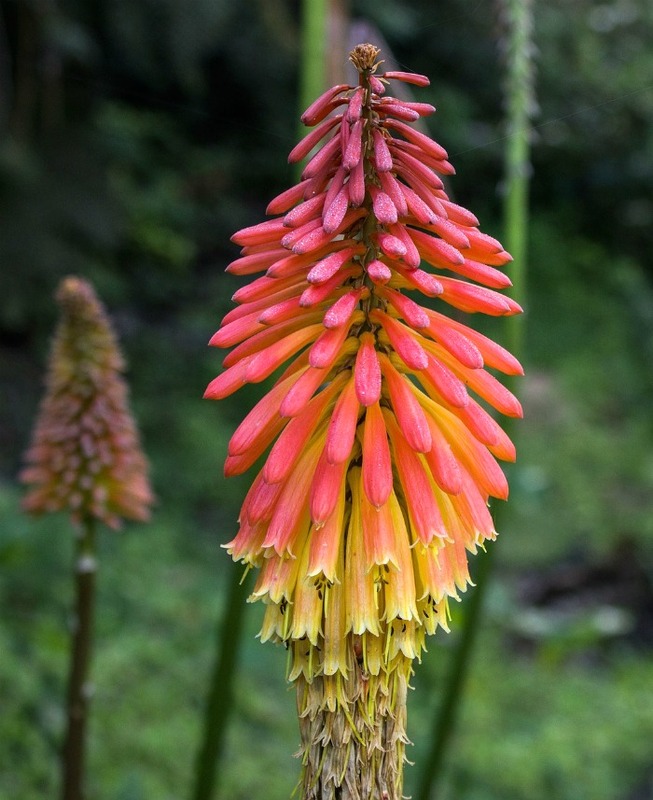 The most well known color is red, of course, but red hot poker flowers also come in shades of yellow, coral, cream and yellow. My flowers start out yellow and turn to bright orange and yellow when they mature. It is easy to see where the common name for kniphofia uvaria comes from. The flowers really do have the look of a burning torch! A mature red hot poker plant can be quite large. The one I have in my southwest garden bed that is about 3 feet wide now and it is only 3 years old. They can tolerate a bit of crowding. In addition to leaving room for the widely spreading crown, the plant also needs height, since the blooms can be as high as five feet. The leaves of red hot poker plants are long and slim, very much like the look of a daylily. Red hot pokers can be grown from seeds. If you plant from seed, be sure to allow 18 to 24 inches between the seeds to give them room to grow. Cold stratification of the seeds is a good idea before planting for best results. You can purchase seed or collect them from the pods of mature plants. Be sure to let them dry out before trying to plant them. Generally, these plants are propagated from divisions of a mature plant. Fully grown plants should be divided every three to five years for better flower production. The plants will also send off offsets that can be divided and planted separately. Division is generally done in early spring or late fall. Plant divisions just below the soil level. Torch lily does well in zones 5-9. 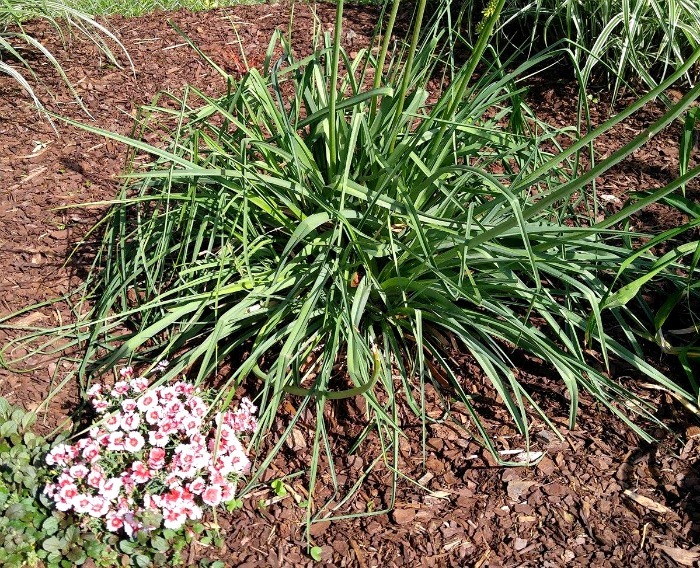 In the colder zones, be sure to lay down 2-3 inches of mulch before winter to protect the crowns of the plant. After blooming has finished for the season, don’t cut back the foliage. Let it in place so that it will nourish the roots for the next season. Once the cold weather really starts to come in the fall, (or early the next spring) is a good time to remove the foliage. With some easy care and the right spot, red hot pokers will give you season after season of vibrant color and hummingbird attracting flowers. When I cut back a overgrown tree in my yard, I was pleasantly surprised the next spring to have this grow and blossom. Must not have been getting enough sun. Thanks for this article’s, now I kno w how to cared for it! When you say deadhead the flower what exactly do you mean. My flowers only bloom once. How do I get them to bloom all summer. When deadheading, don’t just remove the flower, cut the flower stalk off just above the rhizome. Be careful not to damage any growing tips that may exist on the rhizome. The flower stalks seem to take a fairly long time to decompose. I throw mine on the brush pile I have for a small animal hideout/shelter. That also places any remaining seeds where birds can get to them easily. I wanted to let you know you have the best advice on growing red hot pokers than anyone on the internet. Thank you for such a good article. 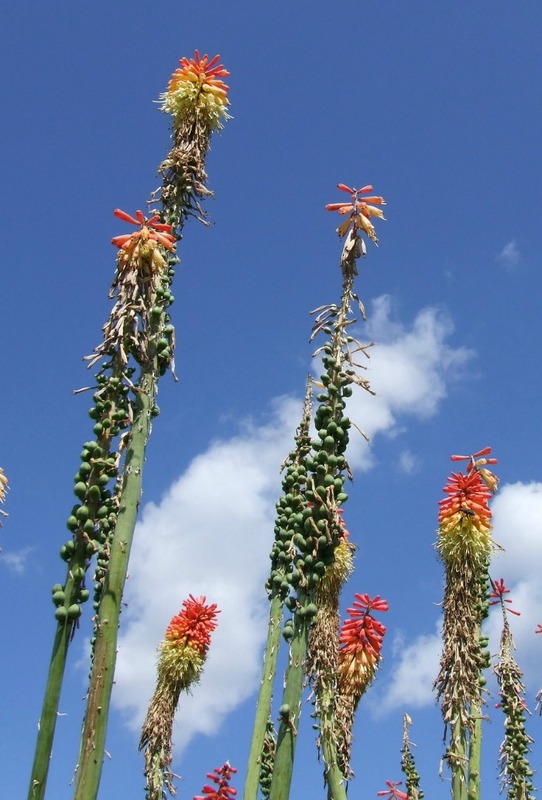 Thank you for posting some of the best information I have seen on Red Hot Pokers/Torch Lilly. I am in somewhat of a bind at my new home (Zone 9) and would welcome input. 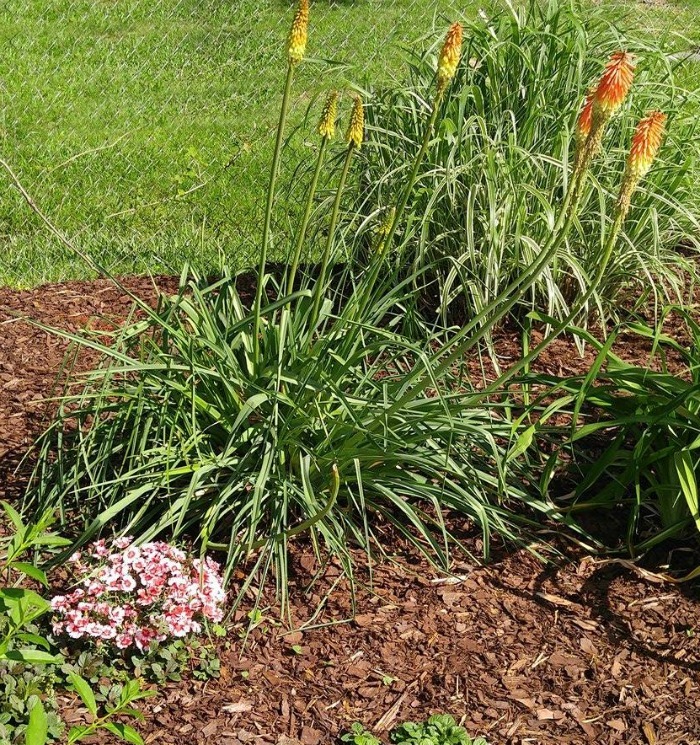 I bought Red Hot Poker bare roots from a well-known supplier through a national retail store. At the same time, I also planted gladiolas and liatris bulbs. That was over 60 days ago and I have seen three plants sprout in total, after which the emerging stalks were immediately chomped down to ground level. During this period squirrels began making a regular appearance in my newly-landscaped yard. I was able to confirm through a Google search that squirrels will eat bulbs, which is what I presumed happened (although I only saw three holes dug in that immediate area — not enough to account for how few bulbs actually came up). Problem is, I have been unable to confirm anything about whether squirrels or rabbits could account for why my efforts to grow Torch Lilly has also failed. I lived in a suburban area previously that was also home to numerous squirrels without any significant issues. Where I live now, which is a semi-rural desert foothill region, there are a limited variety of nearby trees and the squirrels spend a lot of time on the ground and in hedges as opposed to the tree canopy (as they did in my old neighborhood). Squirrels and/or rabbits not only ate all emerging growth from my bulbs/torch lilies but removed all the flowering stalks from my Sea Lavender. They also set into my tomato, which had been out just one day and had no fruit on it whatsoever (silly me, I thought they wouldn’t be interested until it had green or red tomatoes on it). On day one, mystery critter stripped the leaves. On day two it ate the tomato plant stem half way down (after which I caged it in wire). Q 1: Why don’t gardening guides — including the encyclopedic Sunset Western Garden Guide — indicate squirrel resistance? I carefully selected landscaping plants that indicated they were deer/rabbit resistant and drought tolerant. However, in hindsight I appreciate that squirrel resistance was not indicated on tags or plant info at garden centers — or in the information I looked up online about how to care for each plant specifically. And because squirrels didn’t deflower the garden where I previously lived, I didn’t see the problem coming. Q 2: Is there any resource out there that indicates not just “resistance” but what plants are toxic to what animals so that I can landscape with plants these critters cannot eat? I had read, as an example, that Larkspur is toxic but that didn’t stop something from stripping the leaves right off the stem. I have an asiatic lily that suffered the same fate (unlike the Larkspur, it survived being stripped of its leaves). Q 3: I have heard of using cayenne pepper and some types of essential oil, such as clove, as a deterrent. However, there are a lot of products on the market many of which have only mediocre reviews on Amazon. What products, if any, have you tried and found worthwhile to repurchase for use in your garden as a deterrent? I had a garden at my previous home but the above experience has made me feel as if I am re-learning everything from scratch. Any input would be welcome! Hi Diana. Lots of things to deal with here. Sometimes the critters just seem to appear. I have not had a problem with anything eating my bulbs until this year. Not a single tulip, liatris, or gladiola come up in my front bed this year in spite of having dozens and dozens of them in past years. The voles got them all. They left the daffodils and daylilies. In my back garden (which also has voles) none of the day lilies were affected. But my red hot poker only had ONE bloom this year so it wouldn’t surprise me if they were in there. Cayenne does work pretty well with squirrels. Here is a page that deals with squirrel repellents. There is a lot of info on toxic plants for animals but it is usually mentioned in a “how to” post about that plant. Not sure why the guides don’t mention squirrels. In our neighborhood, they were not a problem until the owl population dropped. Then they were everywhere! I have my red hot poker in a pot in the sun. The stalks are really short and just started showing up. Had begun to think it wasn’t going to bloom. This is the 2nd year I’ve had it in the same pot/location. Last year it did great. Any thoughts? Should I fertilize it? I’m zone 9 btw. In the winter, I’m supposed to cut all the foliage back, yes? I didn’t do that last year…didn’t know I was supposed to. 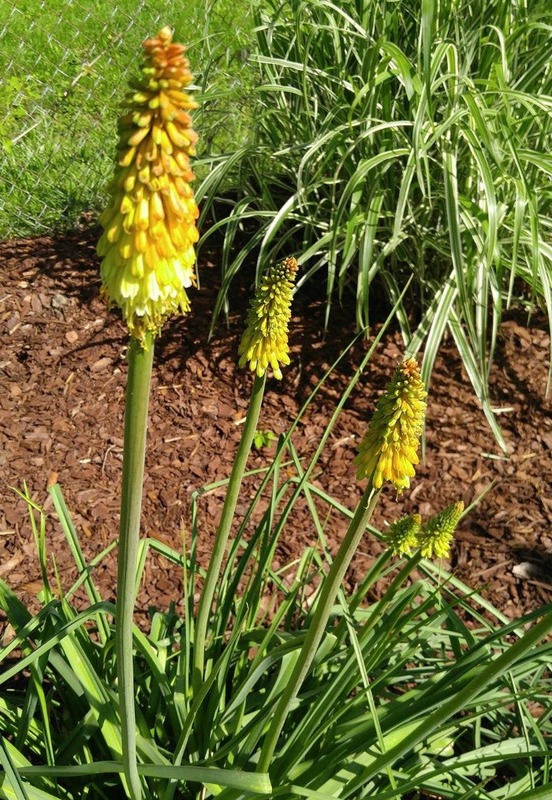 None of my red hot pokers bloomed this summer…..I have had the plants In The ground for at least 3 years….and they have bloomed each year..I have 5-6 plants…None bloomed…any ideas? Hi! I received a few cuttings about 3 years ago. I planted them and each year the foliage and leaves grow long and well- but never a bloom ;( full sun, well draining soil. They have multiplied since I planted (in the ground) since then, but nothing more. Each year I hope I’ll see something- everything else does pretty out there. Thanks for any tips! I divided my red hot pokers in March this year. I am wondering if they will bloom this year or will I have to wait until next year. When I divided mine last year, they didn’t bloom after division that year. I think it would depend on how early you divided them, perhaps.